Thanksgiving weekend is upon us, and while there may not be a true bounty of new releases, the two that we do get represent a couple of emergent franchises – one a follow-up to a surprise hit, the other a spin-off of a previously lucrative animated franchise – that will test audiences' loyalties but could also provide box office fireworks. The best part of the otherwise fairly lifeless and tame Madagascar movies over the course of three movies has been beyond a doubt its ancillary characters, the penguins who escaped along with the original four zoo animals. A group of four scheming and hyper-intelligent (well, at least a couple of them) flightless birds, they've been on the sidelines of the previous three movies so far, participating in ever manic adventures that end up influencing the main plot in subtle ways. In Penguins of Madagascar, they now get their own story detailing just how they became such dashing international birds of mystery. 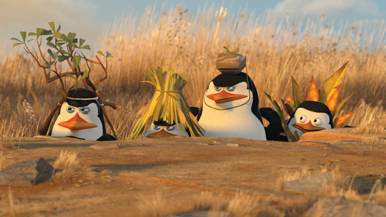 Starting with a bit of an origin story, the four penguins are inducted into a international animal spy agency led by a wolf (voiced by Benedict Cumberbatch) named Agent Classified (not his real name, but, you know), as they battle the forces of Dr. Octavius Brine (voice of John Malkovich) with his plan to something something, does it really matter? It's all about wacky, over-dramatic penguins who generally refuse to take the events around them seriously, even as they hatch fiendishly complicated schemes.